The nuclear plants near Chennai are vulnerable if sea level rises by three metre, a study by Tamil Nadu State Land Use Research Board along with Indo-German Centre for Sustainability and IIT Madras. CHENNAI: The nuclear plants near Chennai are vulnerable if the sea level rises by three metre, the study by Tamil Nadu State Land Use Research Board along with Indo-German Centre for Sustainability and IIT Madras said.The study, which covers Pulicat Lake to Mahabalipuram while taking into account the three districts of Kancheepuram, Chennai and Thiruvallur, stated that all the power plants in the State will be vulnerable if the sea level rises by three metres due to storm surges and climate change. There are seven power plants along the coast in these three districts; three nuclear plants, three thermal and the last one gas turbine. All three thermal power plants would be at the receiving end if the water goes up by just a metre in the next three decades as is expected. In the case of the nuclear plants, there will not be much damage if the sea rises by one metre. But if the change were to be more extreme and rise by three metres, Madras Atomic Power station Units 1 and 2 and the prototype fast breeder reactor at Kalpakkam could be affected. The study considered this as a possibility, as it factors in future storm surge becoming more frequent and intense, reaching up to 4.35 metre and 6.85 metre.It is not just the power plants that face the risk. 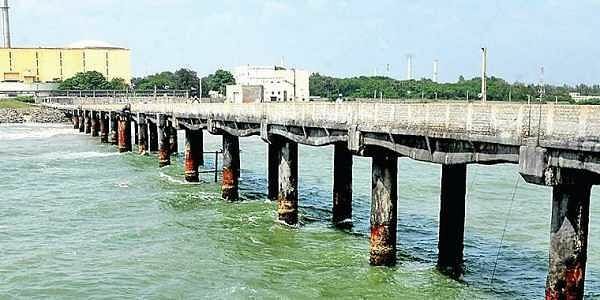 Desalination plants that have helped Chennai tide over a difficult summer are also vulnerable to rise in sea level, the study warned. These facilities will be impacted if the sea level rises just one metre, it added. “We recommend that the State government reconsider promoting desalination plants, and rather go in for water harvesting tanks and ponds and expand the capacity of present ponds in area that will be protected from 7 metre to 10 metre inundation,” the study stated.The total loss due to one metre sea rise on power infrastructure, sewage treatment plants and desalination plants is estimated to be `46,963 crore. It will go up by an additional `10,000 crore if the level was to up by three metres.